Augsburg seniors Ashley Stoffers and Erin Olsen have been awarded the esteemed Fulbright scholarship. The scholarships, administered by The Institute of International Education, provide fellowships for students to study, research, and/or teach abroad. Stoffers will be located in Korea, and Olsen will teach in Venezuela. Dixie Shafer, Director of the Office of Undergraduate Research and Graduate Opportunity, guided the students through the grueling application process and encouraged Stoffers and Olsen to strive toward serving their community and world. "It was a long application process that involved writing a personal statement, writing a statement of proposed study, getting letters of recommendation, being evaluated by language evaluators, and an interview," said Stoffers. 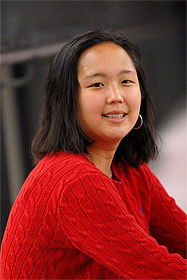 An excerpt from Stoffers' statement of proposed study reads: "During my school-aged years, my adoptive parents attempted to familiarize me with my native Korean culture by enrolling me in Korean culture camps, celebrating Korean holiday traditions, and encouraging me to write letters to my birth family. These attempts were often met with resistance, because I did not want to be recognized as Korean, or even Korean-American, but strictly as American. My attitude changed from that of resistance to that of curiosity. I am now eager to engage with my birth place." Olsen's love of teaching and passion for Spanish-speaking countries drew her to apply for the scholarship located in Venezuela. "I received an English teaching assistantship to Venezuela. I had to apply specifically to that country. There were two of these grants available in Venezuela, so I was one of two to receive it," said Olsen. Stoffers checked her mailbox on a daily basis in hopes of finding the envelope from Fulbright. "Ashley called me the minute she found out she had received it, wondering if I had heard any news yet," recalled Olsen. "I checked my campus box, and it had a thick letter from Fulbright. I felt a mixture of excitement and relief upon learning that I had receive the fellowship -- excitement to go to Venezuela and to have been chosen, and relief that 8 months of waiting were finally over." Both women will be gone for a year. They hope to gain more knowledge of the world around them, as well as give back to the communities in which they will be teaching. Stoffers and Olsen received immense support from their families and communities and are thrilled to have won such a prestigious scholarship.